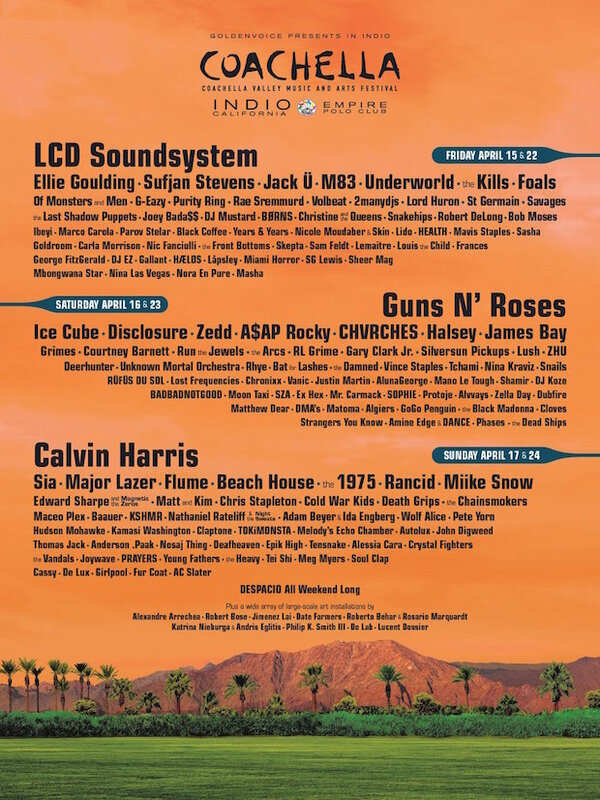 Tonight, Coachella unveiled their 2016 line-up that will take over Indio, California for two consecutive weekends on April 15-17 and April 22-24. Headliners include, LCD Soundsystem, Ellie Goulding, Jack Ü, Calvin Harris, Sia, Major Lazer, Ice Cube, Disclosure, A$AP Rocky, CHVRCHES, and the legendary Guns N’ Roses! That’s not even scratching the surface, acts such as The Chainsmokers, Zella Day, HEALTH, Vince Staples, and more will all be on deck. Passes for the festival go on-sale this Wednesday, January 6, at 11 am. Check out the complete line-up below! Next Next post: News | G.O.O.D. Fridays are Back!